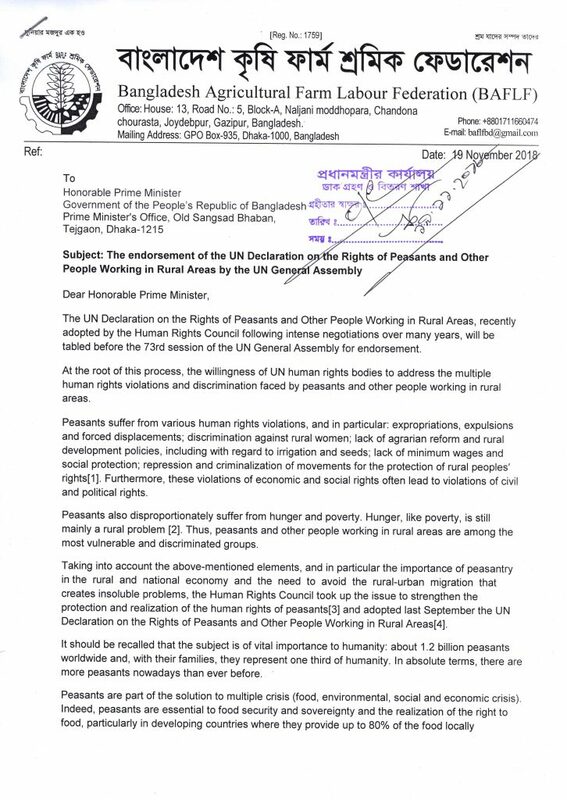 17 November 2018: In a letter sent on Saturday to Mr Syed Akbaruddin, Premanent Mission of India to the United Nations and copied to the Prime Minister and President of India, the Indian Farmers’ Movements and Civil Society organisations have urged the Government of India to fully support the UN Declaration on the Rights of Peasants and Other People Working in Rural Areas, which will be discussed at the 73rd session of UN General Assembly in New York. 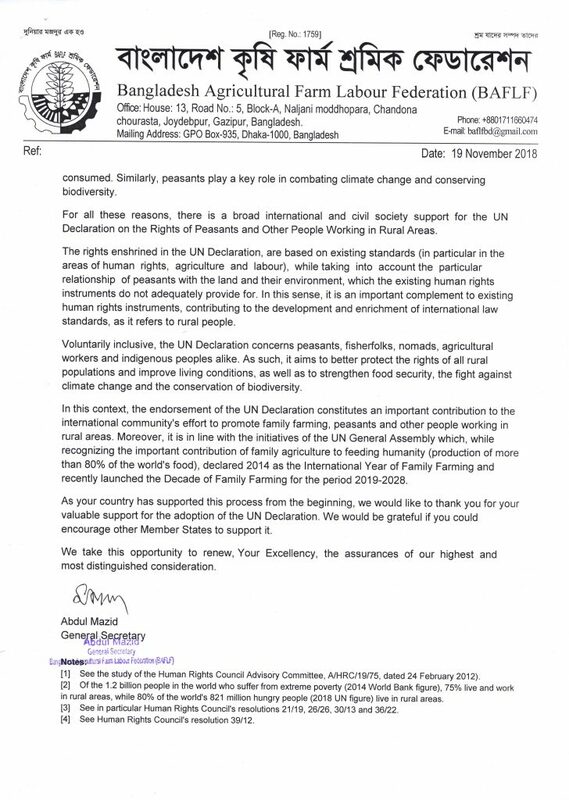 On a similar note, the Bangladesh Agricultural Farm Labour Federation also sent a letter to the Prime Minister of Bangladesh, seeking support for the UN Declaration. We are representatives of peasant organizations, civil society, activists, NGOs, and citizens from all corners of India. We are writing to request your full support for the UN Declaration on the Rights of Peasants and Other People Working in Rural Areas which will be discussed at the 73rd session of UN General Assembly in New York. The resolution to adopt the UN Declaration was recently passed at the 39th session of UN Human Rights Council after six years of intense talks (A/HRC/39/L.16), with an overwhelming majority – 33 votes in favour of the Declaration. India has always been very supportive of the process and we fully appreciate that. As you are well aware, the process was initiated by the Human Rights Council in September 2012 (UN Human Rights Council Resolution 21/19) — and the intergovernmental working group was formed following a report of the Advisory Committee recommending the adoption of a new international instrument in the form of a United Nations declaration to address the multiple human rights violations and discrimination suffered by peasants and other people working in rural areas. In 2012, a study by the Human Rights Council’s Advisory Committee (its body of experts), recognized peasants and other people living in rural areas as victims of discrimination and systematic violations of their human rights and recommended the adoption of a United Nations Declaration on the rights of peasants and other peoples working in rural areas as well as the recognition of the right to land, among other rights, in order to better protect and promote their rights. Therefore, this is an immensely important initiative for millions of peasants and other rural workers throughout the world. Inclusive by design, the Declaration concerns not only peasants, but also fisher-folks, nomadic pastoralists, agricultural workers and Indigenous Peoples. The United Nations Declaration can undoubtedly contribute to better protecting the right to a decent livelihood in rural areas. It will also reinforce food security, solutions to climate change, and the conservation of biodiversity. The UN General Assembly has a crucial role to play in ensuring the adoption of this declaration. This UN Declaration will reinforce the human rights of peasants and other people working in rural areas. It would represent an important contribution to the efforts of the international community in favour of family farming, peasants and other peoples working in rural areas. This adoption will be in line with the initiatives of the United Nations General Assembly which, while recognizing the important contribution of family farming to feeding humanity (production of more than 80% of the world’s food), declared 2014 the International Year of Family Farming and recently launched the decade of Family Farming from 2019-2028. The declaration will reinforce existing human rights standards. As this UN Declaration will be voted on during the 73rd session of UN General Assembly, we urge India to vote in favor. We deeply appreciate that India has been supportive of this process so far. We would be grateful if you could encourage other Member States to support this Declaration.